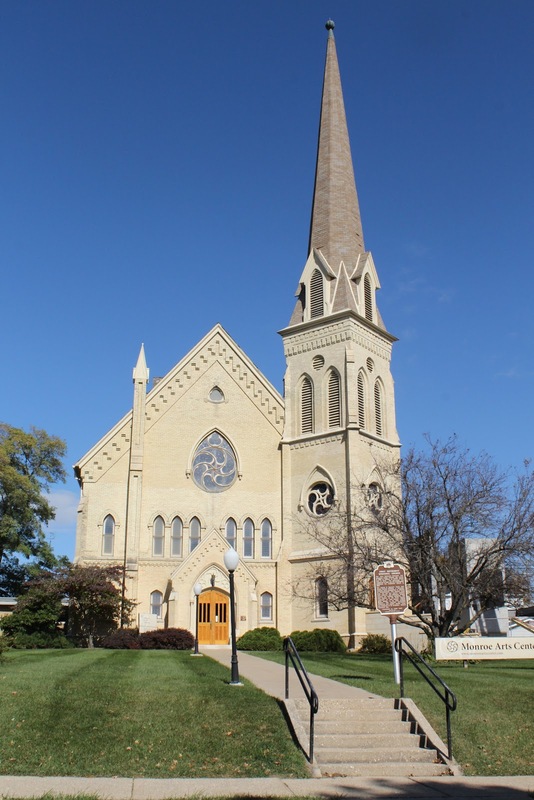 The First Methodist Episcopal congregation began building this church in 1869 to replace an earlier church built in 1843. The parsonage was completed in 1886 and the congregation dedicated the completed church in 1887. 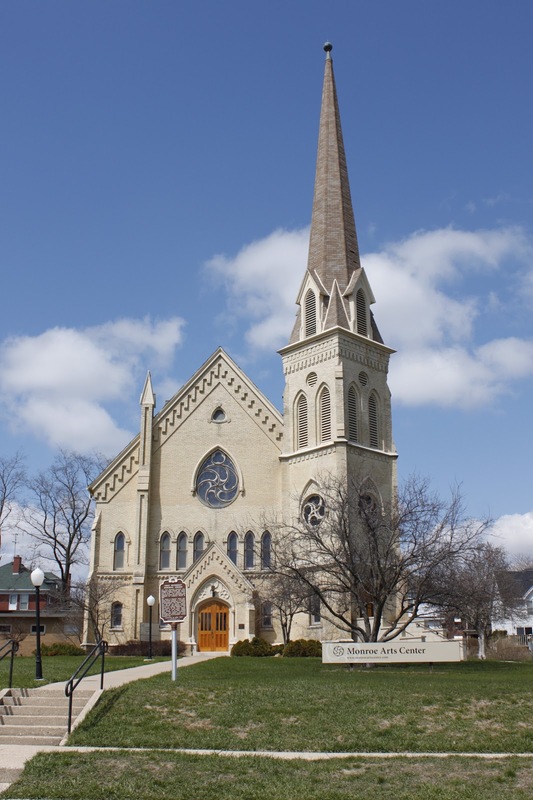 The church is Monroe's finest late-Gothic Revival building, a European-inspired style popularized in America as ecclesiastical. 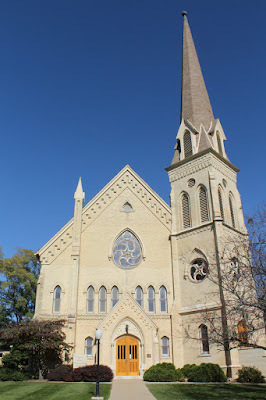 The church's steep roof, the tall and narrow pointed-arch windows, and elaborate window tracery are stylistic hallmarks. The rose window on the front facade, composed of tear-shaped stained glass panels, is its most striking feature. The church's decorative brickwork and angled corner tower are hallmarks of its architect, Edward Townsend Mix. 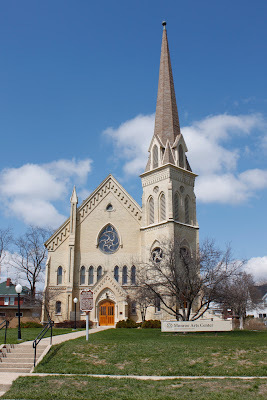 Edward Townsend Mix (1831-1890) designed this church at the height of his career. Born in Connecticut, he trained in the New Haven office of church architect Sidney Mason Stone. 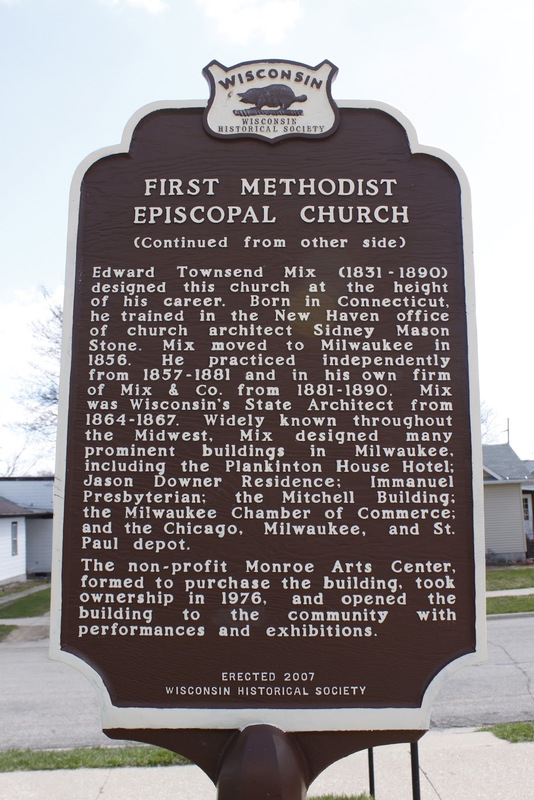 Mix moved to Milwaukee in 1856. He practiced independently from 1857-1881 and in his own firm of Mix & Co. from 1881-1890. Mix was Wisconsin's State Architect from 1864-1867. Widely known throughout the Midwest, Mix designed many prominent buildings in Milwaukee, including the Plankinton House Hotel; Jason Downer Residence; Immanuel Presbyterian; the Mitchell Building; the Milwaukee Chamber of Commerce; and the Chicago, Milwaukee, and St. Paul depot. The non-profit Monroe Arts Center, formed to purchase the building, took ownership in 1976, and opened the building to the community with performances and exhibitions. 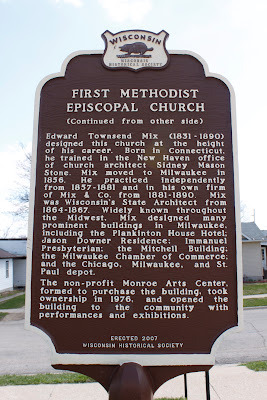 The marker is located on westbound 11th Street, between 13th Avenue and 14th Avenue, at 1315 11th Street, Monroe, Wisconsin 53566. The building is now home to the Monroe Arts Center. 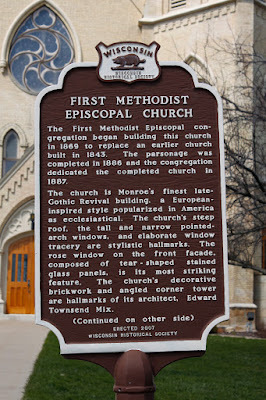 See also, The Old Methodist Church 1869, also at this location. 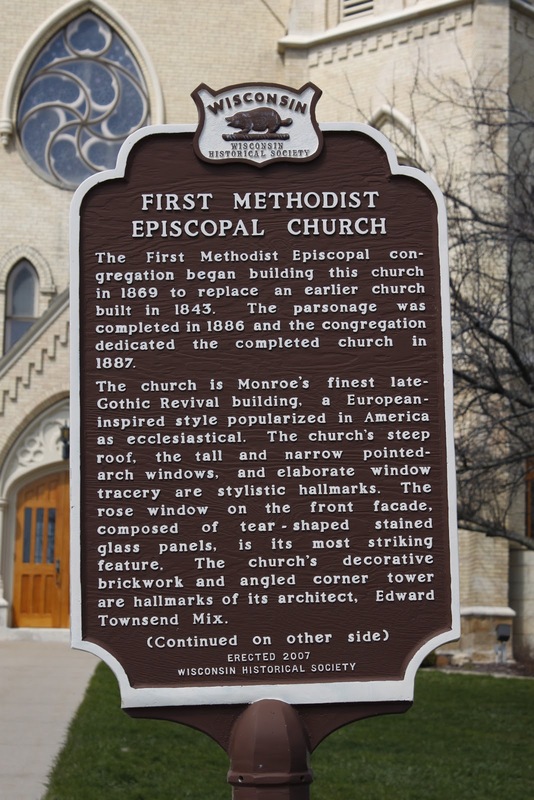 First Methodist Episcopal Church is located in Monroe, Wisconsin.